Cases include Sarah Hansen, a cheerleader and all-around good kid, she met a nightmarish death. Alec Kreider: he had a hunger for murder and started with his best friend’s family and Anthony and Nathaniel Cook, a murdering duo who terrorized Toledo for years. This a good collection of a variety of true crimes. Some I've read about others I hadnt. I like that each story was short, but long enough to tell the whole story without having to hear too many details. Narrated well also. My favorite narrator's were the late great Frank Miller and the wonderful George Guidell...going to find other Audible with Pierce..
Great stories about different murder cases! 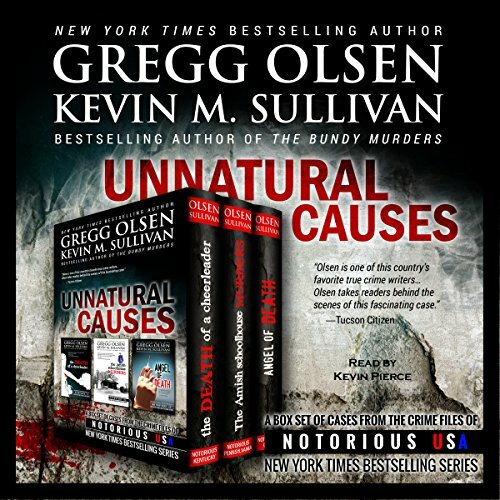 Where does Unnatural Causes rank among all the audiobooks you’ve listened to so far? This is a set of smaller books that are from the Notorious USA series. There are several stories included such as Donald Harvey (serial killer) , Sarah Hansen murder, Heather Teague disappearance. etc. There are quite a few more as well. It is well written and well researched. I found it to be interesting, and included stories I was not aware of, which made it even better for me! I really liked this book, as I like anthologies a lot. The stories are short and sweet, without the extra fluff. I do recommend this book!